Pump sandy or muddy water from construction pits, pump dry flooded cellars, drain shafts, pump empty ponds or pools or as active flood protection. 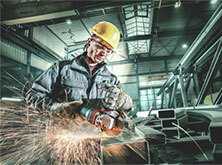 Metabo offers for all drainage jobs the right pump system including accessories. 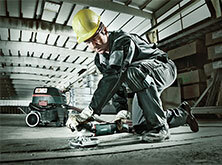 Metabo pumps are designed for safety and long service life. They are made from impact-proof plastic, robust stainless steel or grey cast iron and have particularly high-quality sealing systems. With the unique XXL warranty you always play it safe with all water and pump systems from Metabo. The powerful Metabo construction and dirty water submersible pumps continue where others stop. Whether you have to pump emtpy and drain construction pits with sandy or muddy construction site water, rain water or groundwater, this makes no difference for our particularly powerful models: the pump quantities of 7,500 to 28,000 litres per hour, even very dirty waste water with dirt particles of up to 50 millimeters diameter (dirty water pump SP 28-50 S Inox). Self-cleaning robust impellers with particularly quiet operation, an integrated overload protection and durable sealing systems ensure absolute reliability. The Metabo dirty water pumps SP 24-46 SG and SP 28-50 S Inox, as well as the Metabo drainage pumps, DP 18-5 SA and DP 28-10 S Inox can thus be used for a variety of applications. Obviously they are also suited for automatic mode and continuous mode. Special applications such as pumping empty of cellars or pumpy dry of construction pits can be done in no time at all with these robust pumps. The combi submersible pumps from Metabo are real multi-talents that can be used both for clear water and for dirty water. Even dirt particles up to a grain size of 30 millimetres are no problem for the combi submersible pump TPS 16000 S Coombi. The two Metabo combi submersible pumps unite three different applications in one compact tool. In automatic mode with float switch the Metabo combi submersible pumps can be used as drainage pump for both clear and dirty water. In manual mode it can be used for low-intake down to a water level of only one millimetre residual water. The special flexibility of the combi submersible pumps is shown in the easy and comfortable change between the different applications by setting the pump foot to the respective function. Metabo clear water submersible pumps are real helpers in an emergency: Whether high water after a strong rainfall has floode he cellar or a defective washing machine has leaked, the Metabo devices pump out the cellar reliably, quickly and automatically. The low-intake clear water submersible pumps TPF 6600 SN and TPF 7000 S pump up to a residual water level of two to three millimteres that can be wiped dry. These pumps can also be used for garden irrigation directly from water reservoirs. The robust housing is made from impact-proof plastic or stainless steel and the integrated overload protection lend the Metabo clear water submersible pumps a particularly long service life. Among the accessories for water and pump technology you will find various adapter, connections, hoses and sets. Many other pumps for irrigation and for domestic water supply are included in the Metabo range of pumps.